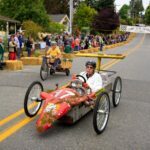 Hundreds of Whidbey Islanders and visitors welcomed a break in the recent heat spell by turning out for Langley’s 2016 Soup Box Derby on Sunday, August 21. 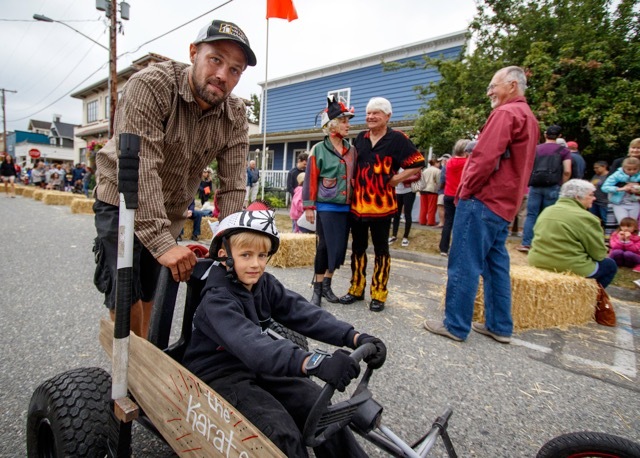 The fun-run, which featured close to 30 “vehicles” this year, is put on by the Langley Community Club. 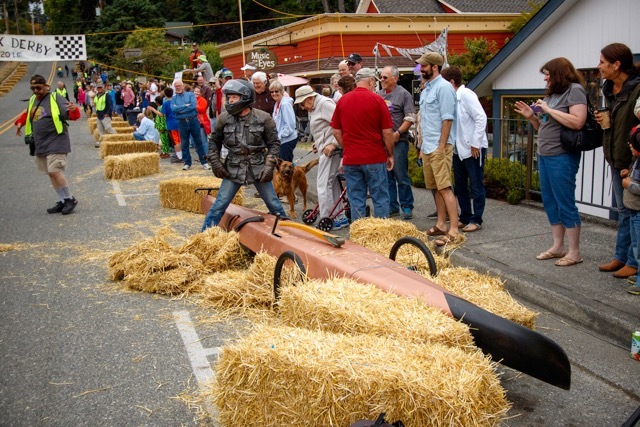 After registration and a quality-assurance check, completed by a run down the hill for each entry to assure braking and safety of the tricked-out barrels, boats and pontoons, the racers towed their craft back up First Street hill and paired off for the first of many two-by-two races. 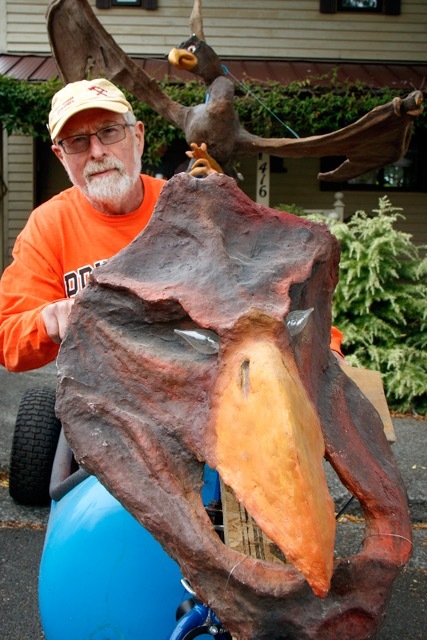 Chris Spencer adorned his vehicle with a fearsome papier mâché triceratops and a pteradactyl that hoovered over the stern. 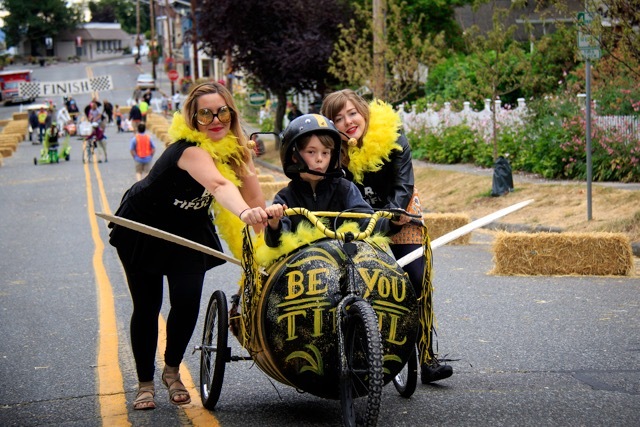 “BeYouTiFul” returned this year, with cosmetic enhancements to the stinger-end. The Karate Kid, aged six and a half, was the youngest driver. 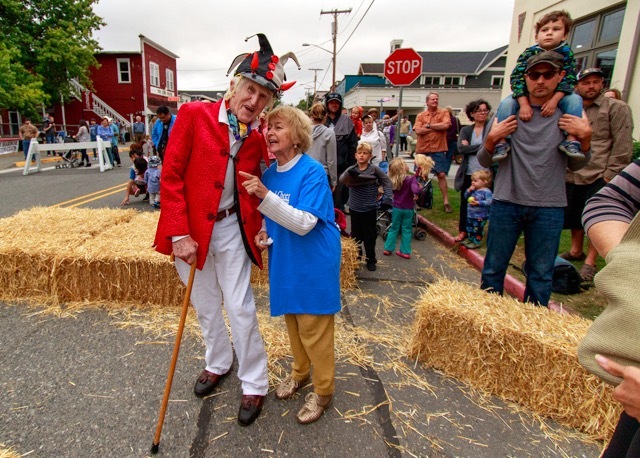 Peter Lawlor, aged 95, gets a happy send-off from family and friends as he begins his practice run. 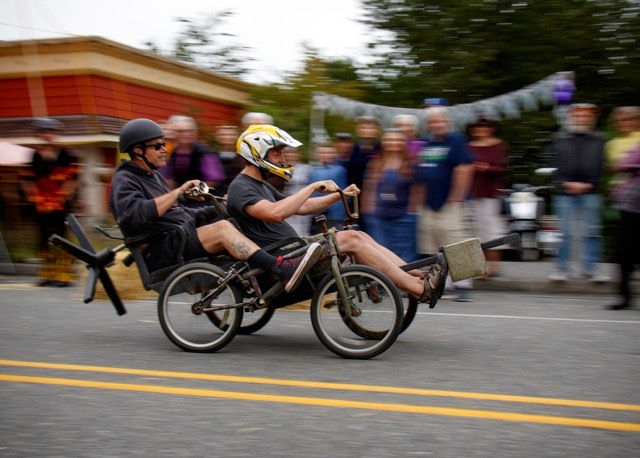 A four-wheeled tandem racer, with a concrete block counterweight extending over the front-end, speeds by the crowd in front of Music for the Eyes. 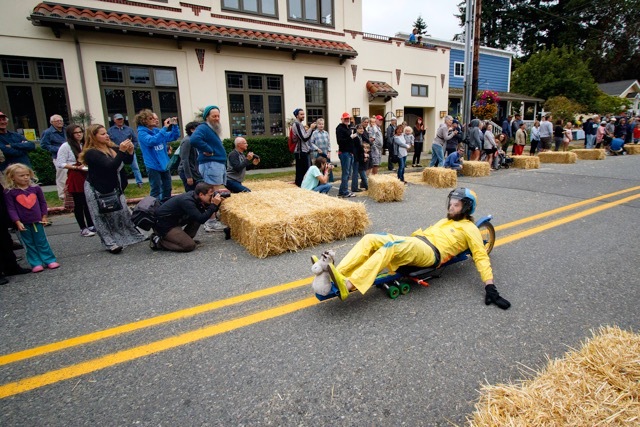 A street luge with handbrakes crosses the finish line first and exits the course. 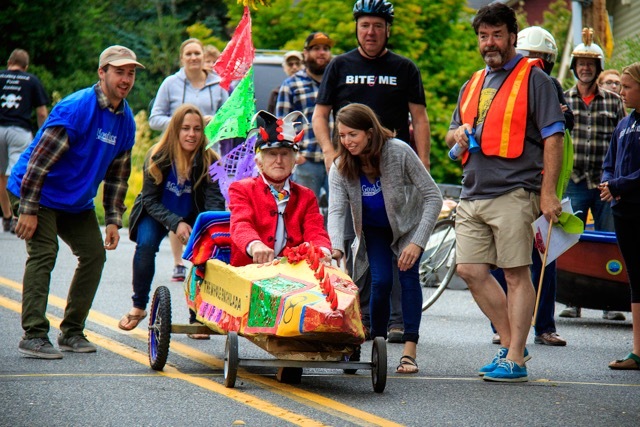 Phil Simon, with aerodynamic advantages, easily beat Cary Peterson in her vegetable cart. 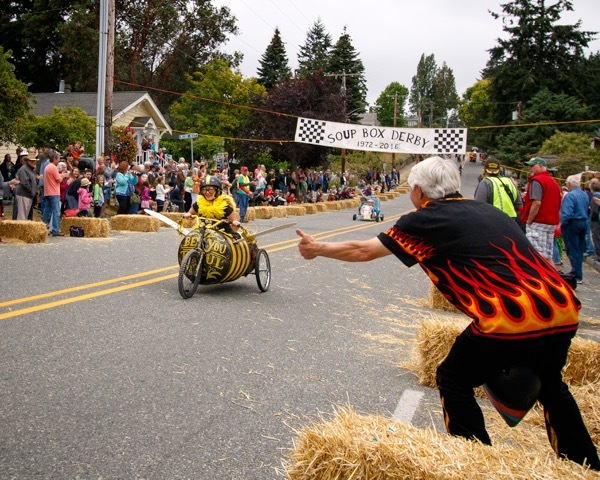 Gary Piper gives an enthusiastic thumbs-up to a competitor from 2nd Street Boutique. Boatwright Brad Price lost control of his speed pontoon racer and crashed. 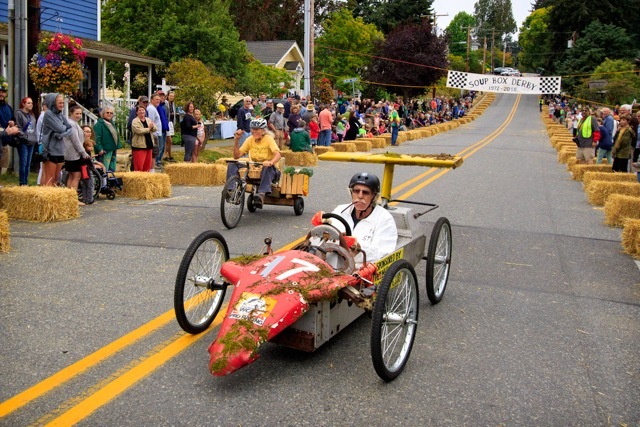 The announcer proclaimed: “We told you this could happen, do not sit on the hay bales!” Fortunately there were no injuries, and Brad only suffered a blow to his pride. Peter Lawlor’s girlfriend, Roberta Brown, is glad Peter will be back next year. Will Collins awarded gold medals to the intrepid participants. 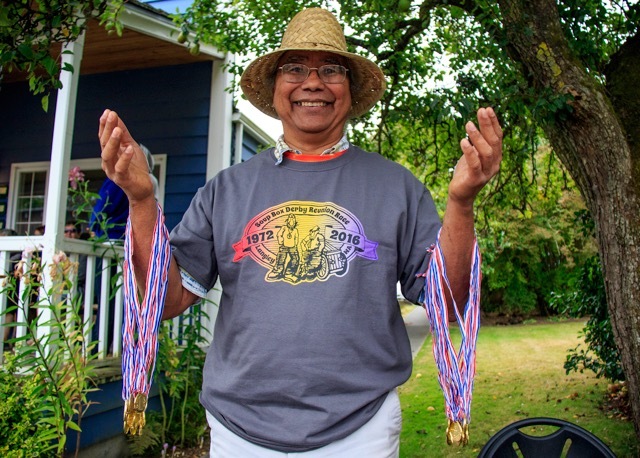 He said he enjoyed making the whimsical trophies with other Langley Community Club members at The Commons, using materials donated by Good Cheer. 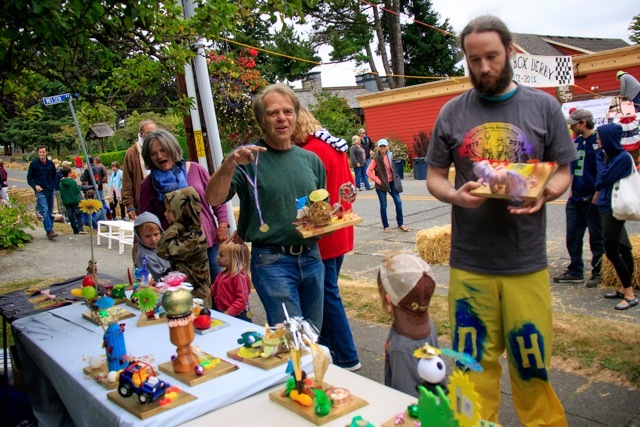 A few of the winning racers pick out their trophies. 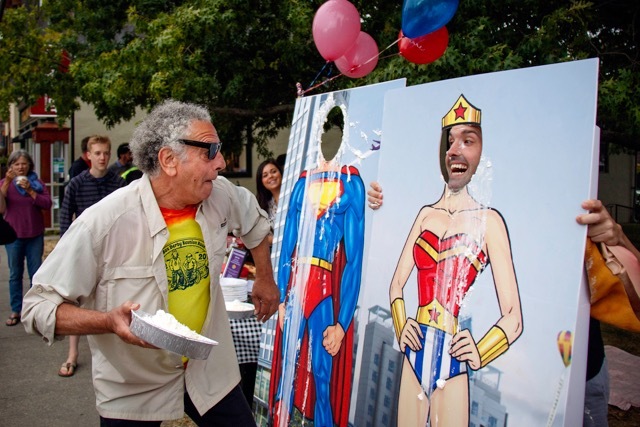 After the final three-way heat, the crowd moved to Whale Bell Park for a pie-in-the-face fundraiser to benefit Good Cheer, Meals on Wheels and the Generation Park Improvement project. Paul Sarkis winds up to deliver a cream pie to his son Charlie. 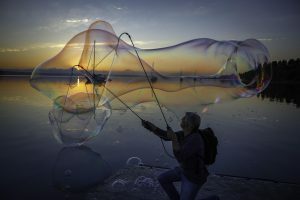 Another marvelous David Welton archive! Thanks ever so much. We were moving furniture and missed the show for the first time in years! Go Peter Go! That’s the kind of 95 I want to be.